Lincoln, Neb., Jan. 9, 2013 -- Did you know that blow flies and beetles are the greatest decomposers in the world? While their consumption of dead things is not pretty, it is an essential part of nature. That process will be expolored on Jan. 20 in the University of Nebraska State Museum's next Sunday with a Scientist program. "Blow flies, Beetles and Bad Guys: Ecology and Forensic Science" will be presented by Amanda Fujikawa and Christian Elowsky, doctoral students in the UNL School of Natural Resources. The event will be from 1:30 to 4:30 p.m. at Morrill Hall, south of 14th and Vine Streets on the University of Nebraska-Lincoln City Campus. Through hands-on activities, the scientists will help visitors better understand the role insects, specifically blow flies and their maggots, play in the decomposition of carcasses and nutrient cycling. As insects breakdown dead tissue, they allow nutrients, such as carbon and nitrogen, to be released into the ecosystem. Without this unpleasant, yet fascinating process, the planet would be overwhelmed with foul-smelling carcasses. These insects are also useful forensically to estimate the length of time a person or animal has been deceased, which can be important in criminal investigations. 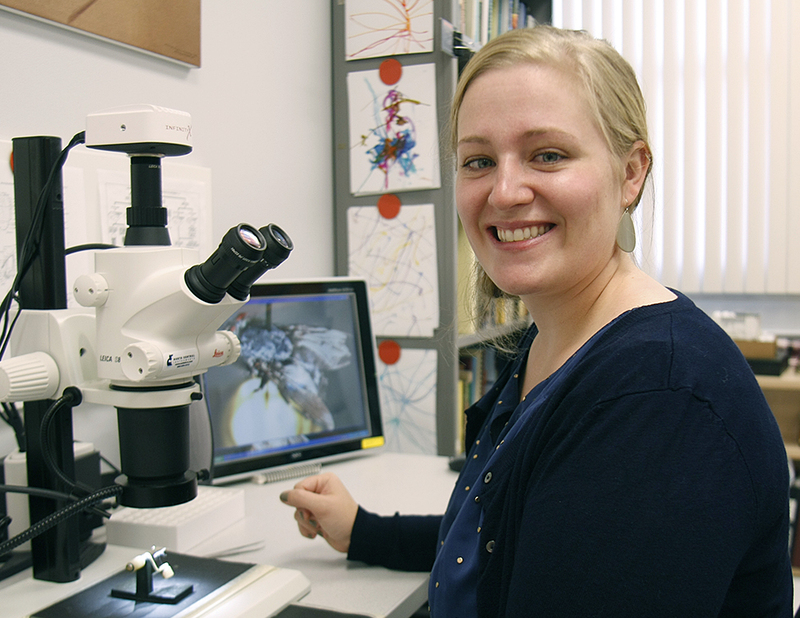 Visitors will be able to view blowflies and beetles up close through microscopes. They may also be inspired to make a piece of art with the help of live maggots. Sunday with a Scientist is a series of presentations that highlight the work of State Museum scientists and those from other UNL departments and institutions, while educating children and families on a variety of topics related to science and natural history. Presenters share scientific information in a fun and informal way through demonstrations, activities, or by conducting their science on site. Upcoming Sunday with a Scientist Topics: Feb. 17 -- Spiders; March 10 -- Archeology; April 21 -- Stormwater management; May 19 -- Microbes; June 16 -- Chemistry; July 21 -- TBA; Sept. 22 -- TBA; Oct. 20 -- Bats; Nov. 17 -- Solar energy; Dec. 15 -- Gene silencing in plants. All programs will be from 1:30 to 4:30 p.m. There will not be an event in August due to the Big Red Welcome Festival. For more information, visit www.museum.unl.edu. The University of Nebraska State Museum in Morrill Hall is open 9:30 a.m. to 4:30 p.m. Monday-Wednesday and Friday-Saturday, 9:30 a.m.-8 p.m. Thursdays, and 1:30-4:30 p.m. Sundays. Regular admission is $6 for adults (19 and over), $3 for children (5-18 years, 4 and under are free), and $13 for families (up to two adults and children). UNL staff, faculty, and students are admitted free with NU ID. Friends of the Museum are also free with valid membership card. There is an additional charge for planetarium shows. Parking is free in front of the museum. For further information, telephone the museum at 402-472-3779, visit its website or Mueller Planetarium's website, www.spacelaser.com, or contact Kathy French, education coordinator, at 402-472-6647 or by email.